Soundings November 2018 – Eco Alianza de Loreto | Loreto, B.C.S. This year’s November 16 Gala was a resounding success and we at Eco-Alianza are grateful to all who joined us for our 11th Anniversary celebration and fundraiser! We also want to thank our loyal supporters who could not attend, but who helped significantly with generous donations. Once again, the sumptuous buffet by Hotel Mision Loreto set the stage for robust bidding during the live auction, resulting in a fundraising outcome exceeding all expectations. Thank you so much to everyone involved with the event, including the underwriters, sponsors, and donors of live and silent auction items, and of course all the attendees and supporters. Kathy and Chuck Mitchell received the annual Eco-Alianza Environmental Stewardship Award for their many years of service to Loreto (on the Board of Directors, the Advisory Board, and for initiating the water laboratory and water testing program), and also for nearly five decades of environmental service through the California company they founded, MBC Aquatic Sciences. Funds raised at the gala will support Eco-Alianza’s expanding environmental education programs, as well as four conservation initiatives about which you will be reading more in Soundings in coming months. These include cooperation with the Marine Park to increase and improve surveillance patrols; support for recycling, solid waste management, and protection of watersheds in Loreto; lab certification for our Coastkeeper water monitoring program; and hiring a marine ecologist to work closely with the Park to conserve sea turtles, conduct research, and help with biological monitoring efforts. These important initiatives are in addition to our ongoing conservation and environmental education programs, and represent a significant expansion for Eco-Alianza. Click here to view photo gallery of Gala and Fundraiser. Click here to view Photo Booth gallery. As reported in the last Soundings, Eco-Alianza served as a sponsor for the 3rd annual Loreto Half Marathon (21K/10K/5K/2.5K), which took place November 11. This year, 554 participants ran, jogged, or walked the various distances in the event, hosted by the Loreto Hotel Association. 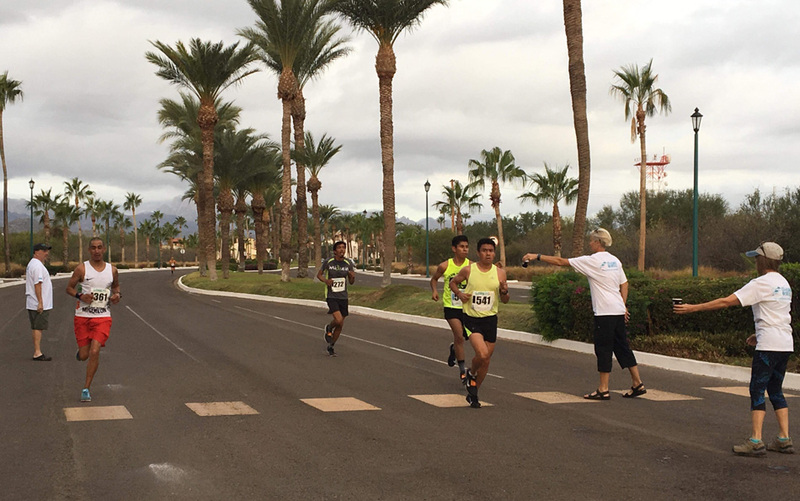 Beginning at the golf course in Nopoló, several Olympians, and race teams from La Paz, Los Cabos, and several other locations, took off at an impressive pace on a delightfully cloudy, cool day. A dozen Eco-Alianza volunteers staffed a hydration station at the 5-kilometer mark, handing out paper cups filled with either water or Power-Ade. The paper cups were a replacement for “hydration bags” that were handed out last year and the year before (bags made of three different kinds of plastic that were virtually non-recyclable). With Eco-Alianza’s recommendation and support, the change was consistent with organizer Norma Garcia’s desire to create a more eco-friendly event. Eco-Alianza’s Volunteer Task Force enjoyed handing out the refreshments as runners zoomed by – repeating the task after they made the loop around the Agua Viva “racetrack” and came by on the other side of the road just past the 8-kilometer mark. 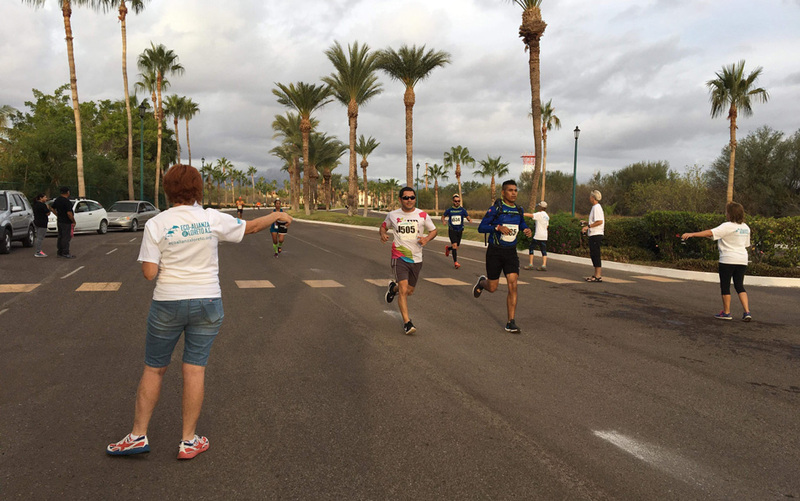 After the runners ran to Loreto they were greeted again by Eco-Alianza volunteers at the Hotel Oasis hydration station, which also served participants for the other, shorter- distance events. At the finish line, where participants grabbed plastic bags of fruit last year, they were treated to trays of fresh fruit with no packaging. Eco-Alianza volunteers also helped participants, as well as family and friends of runners, to correctly use recycling and composting bins for all the event’s solid waste. In all, almost 30 Eco-Alianza volunteers helped the event cut back on plastics and solid waste, as part of the organization’s long-term Zero Waste Initiative, which already is presenting workshops to restaurant and hotel employees in Loreto to help them reduce and better manage the waste stream at each business. For more information on Zero Waste concepts, check out the website of the Zero Waste International Alliance. Norma Garcia expressed satisfaction with the logistical changes urged and supported by Eco-Alianza for this year’s event, and both organizations agreed to continue pursuing improvements each year towards making the Half Marathon a truly “Zero Waste” event. For next year’s November 10 event, Norma said, she will be approaching Mexican companies producing green products for the hydration stations, as well as other green gifts for the runners. 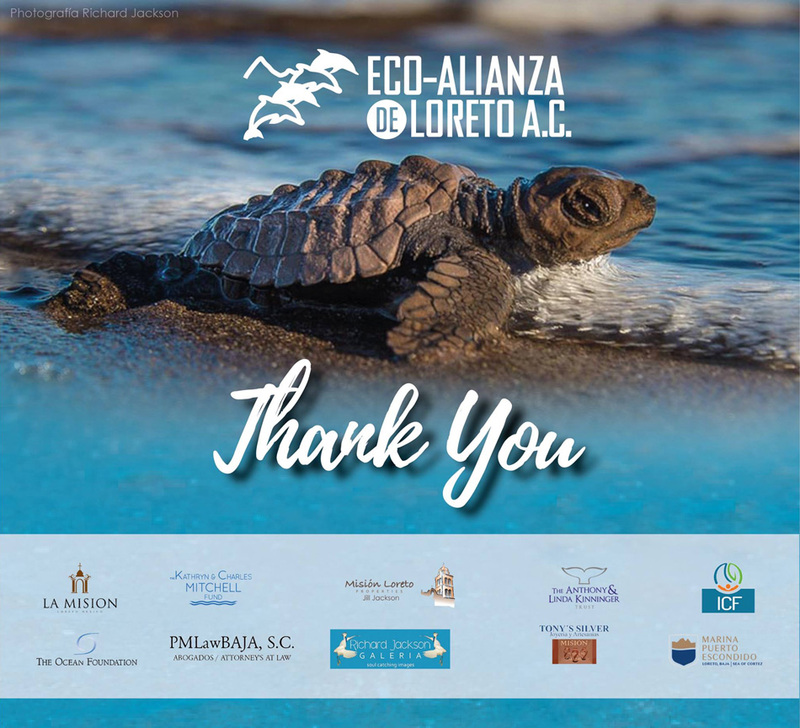 As reported here two months ago, Eco-Alianza supporters this year made possible the continuation of a program to monitor and protect from predators the sea turtle nests on five of the most active nesting beaches adjoining the Parque Nacional Bahía de Loreto. Community members also have used a sea turtle hotline to report nests that they have discovered on additional beaches (which also have been protected). Here are the nest numbers from Park Biologist Mariana Salgado, as of November 7, which are slightly higher than last year’s totals already (and turtles are expected to continue nesting into December). 42 are from the threatened Olive ridley (Lepidochelys olivacea) and one was from the endangered Black turtle (Chelonia mydas). The Black turtle nest produced 45 live hatchlings. Unfortunately, Mariana reported, nest hatch rates this year have been low, most likely due to very high temperatures and low sand humidity because of no rain. 18 of the nests were still in their incubation phase as of the November 7 report. Photos, clockwise from top left: Mature adult out in broad daylight and at full alert. Mature adult with ears laid back to lower its profile and help it hide. Kit, at under a week old and already weaned from milk and completely on its own. Jackrabbit hunting team that can take them at any age. The Black-tailed Jackrabbit (Lupus californianus) has a huge range and is a very important member of its community throughout. They provide food and hydration for a large number of predators, including Coyotes, cats, foxes, snakes, and both diurnal and nocturnal birds of prey. The Jackrabbit isn’t actually a rabbit at all, but is a hare. As with most hares it is built for wariness, speed, and maneuverability. At first, though, it will be abandoned by its mom after a few days of nursing and spend most of its youth hiding near where it was born and being menaced by a range of creatures that would like to dine on it. After a few weeks of being the tiny morsel that began life with open eyes and covered with hair, the fully formed adult will be able to outrun, outmaneuver, and outsmart all but the most proficient hunters. These are the times when it will face its most efficient and frequent predator; the Coyote (Canis latrans). The life and death dance that the Coyote and the Jackrabbit engage in is savage and in ways also beautiful. 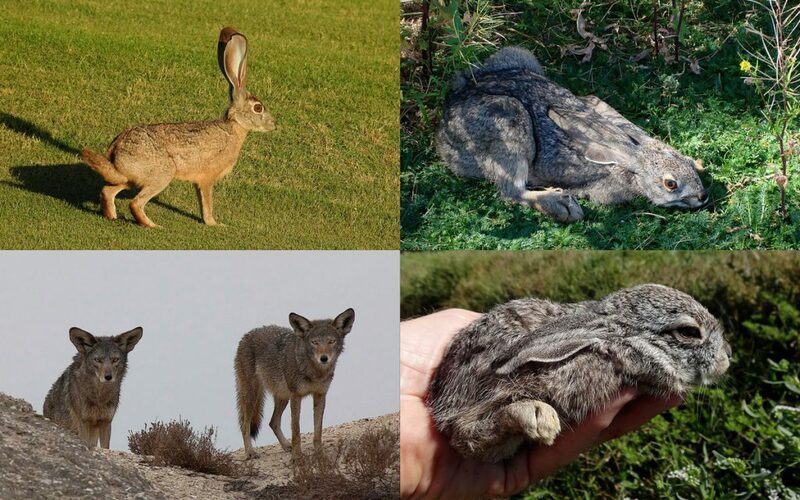 The Jackrabbit’s fur reflects light in the same wavelengths as the gravelly ground it haunts so it’s hard to see, especially in the weaker light of dusk and dawn when it is most active. The Jackrabbit’s eyes, ears, and nose are fine tuned beyond our reckoning. It is smart, always very aware of which way its own scent is travelling, always attuned to the slightest sound, always alert to sights and scents that could spell trouble. Its hind legs are so big and strong that at full stride its back feet hit the ground ahead of the front ones. It can run at nearly 40 miles an hour over open ground, jump 20 feet, and execute a near ninety-degree zig on a dime. The Coyote’s moves include stamina, teamwork, and confusing vocalizations that may cause its prey to make a fatal mistake. Need the perfect holiday gift for friends and family? 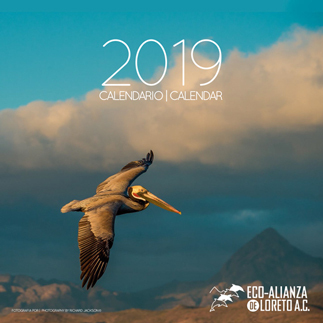 Order your 2019 Eco-Alianza calendars now through the Eco-Alianza website, or pick them up now at our CenCoMA headquarters, Richard Jackson Gallery, Gecko’s Curios, Hotel La Mision, Roxana Silver Desert, Sea Coffee, Ferremar, Tony’s Silver, the Museum, El Gavilan, Posada del Cortes Hotel, La Cholla Mini Market, and other supporting retail locations around town.